an antibody that has been altered to give it a catalytic activity. Unlike a natural antibody, a catalytic antibody can disarm more than one cocaine molecule, possibly offering a long-lasting immunity against the drug, researchers report in the March 26 SCIENCE. performed the disfavored chemical maneuver anyway with the help of a new catalytic antibody. 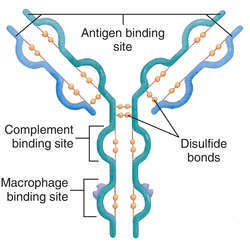 A catalytic antibody (CAb) is a type of monoclonal antibody that cleaves and thereby permanently inactivates a target molecule, and goes on to locate and cleave other identical targets in a continuing process (a catalytic effect) while circulating in the body. The increased breakage rate proved the viability of the catalytic antibody concept, notes Kim D.
Under development are microalgae-based products for the biopesticide markets and a patented aldolase catalytic antibody under license from The Scripps Research Institute.